Waste Minimization: the New Eco-Friendly Trend for Home Buyers? When the average homebuyer sets their sights on finding an “eco-friendly” or “sustainable” home, the conversation usually revolves around features like energy-efficient appliances, long-lasting materials, rainwater collection, or solar panels, features for which 68 percent of Realtor.com users say they’d even pay more. What doesn’t seem to make the list are concerns about environmentally conscious waste management practices — yet. But with increasing awareness about single-use plastics pollution and the recent news that China is no longer accepting our contaminated recycling, homebuyers might start seeking out communities that offer more responsible waste management solutions — especially here in Illinois, where residents produce 23 percent more waste per capita than the average state, and only 37 percent of that is ever recycled. Several U.S. cities have already pledged to go zero waste. In Austin, Texas, and Seattle, mandatory recycling and composting ordinances and an improved collection and processing infrastructure have helped those cities achieve 50 percent and 60 percent diversion (the amount of waste that’s recycled instead of going to the landfill) respectively. San Francisco made it to 80 percent diversion in 2012, with a unique three-bin curbside collection program and the largest urban food scraps composting collection program in the U.S. The success of these programs shows there isn’t a one-size-fits-all solution — it’s up to local officials and waste management providers to devise solutions, and residents to adapt. Chicago has a particularly complicated relationship with recycling — last year it was reported that the contents of nearly a half million of the city’s blue recycling bins were sent straight to the landfill rather than being recycled as residents expected. This is due to a strictly enforced rule that a bin containing even a single non-recyclable material is deemed “grossly contaminated” and unfit for processing. 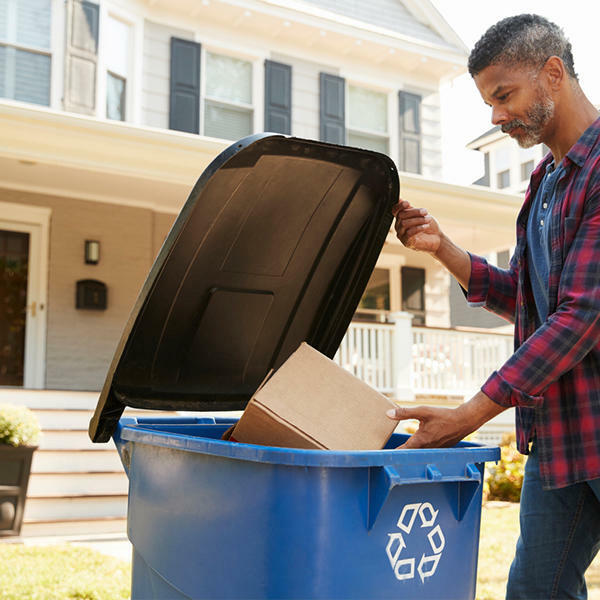 Despite a state-wide initiative to inform residents on proper recycling and waste management practices, non-recyclables like food scraps, plastic grocery bags, and batteries still make their way into recycling bins, and ultimately the landfill. But as some areas struggle to get their recycling programs on track, many communities in Chicagoland are embracing the path to greener garbage. In Lombard, a new composting system is making it easier for residents to participate and help to divert the 40 percent of waste that is organic materials and food scraps from going to the landfill. Grayslake and Oak Park have adopted similar curbside composting programs, and Oak Park has even offered incentives to encourage residents to join. So far, these programs are opt-in and come at an additional cost to the residents, but for those who are already willing to pay a little extra to lower their environmental impact — and aren’t ready to do their own backyard composting — the availability of curbside programs could be a selling point.